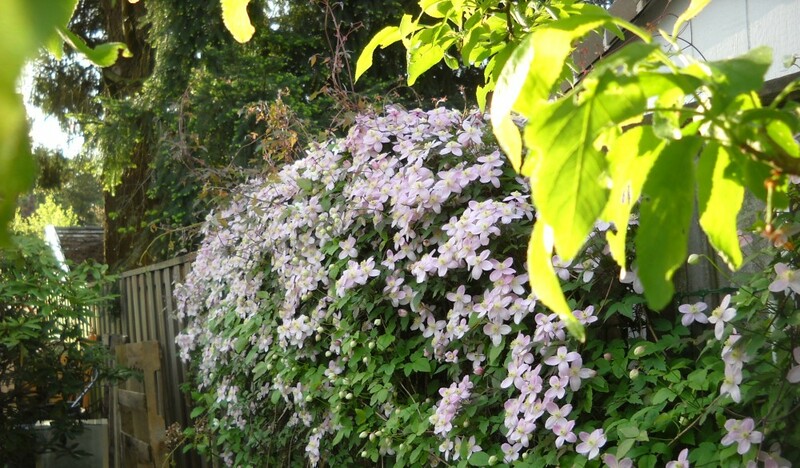 Why would California governor Jerry Brown be proud if you were “growing nothing in your yard”? Not even a joke. I guess I don’t have to tell you that being among green leafy things that are growing is a good thing. Maybe the comment came from This is That. If you have grass, and want to run around on it. the recommendation is smart irrigation. 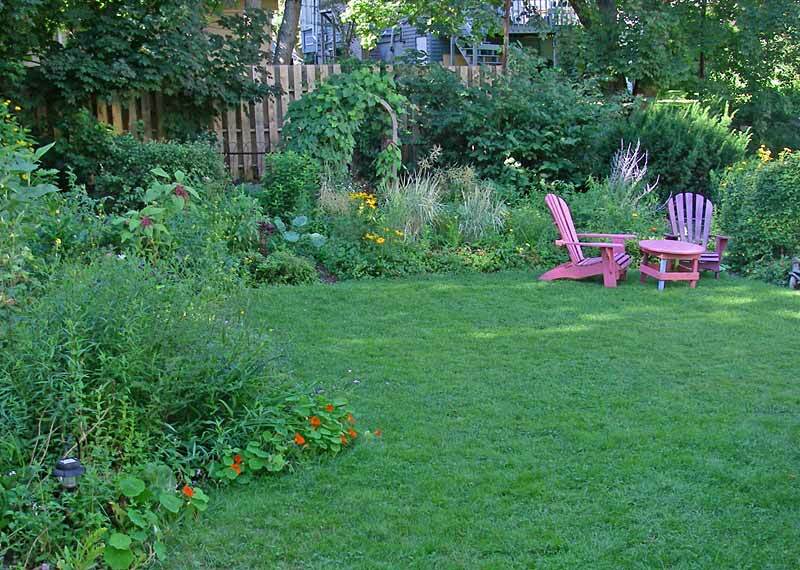 One good option, but there are lot of other good options, including adding Dutch white clover (Trifolium repens) or microclover (DLF Trifolium), which stay green with less water. Vegetables–apparently a better thing to buy them at a farmer’s market than growing yourself. The assumption that the farmer is more efficient at water use than the home grower. 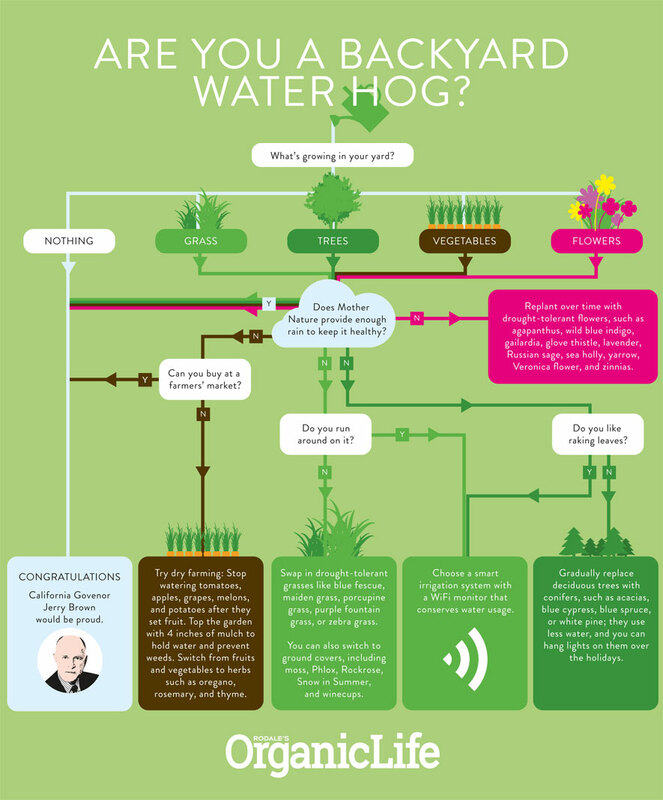 I think I’ll send this infographic to This is That and see what they make of it! And in case you’re still determined to grow something yourself, don’t bother with all those things that might want a little water, like carrots or beets or broccoli, stick to Mediterranean-type herbs. 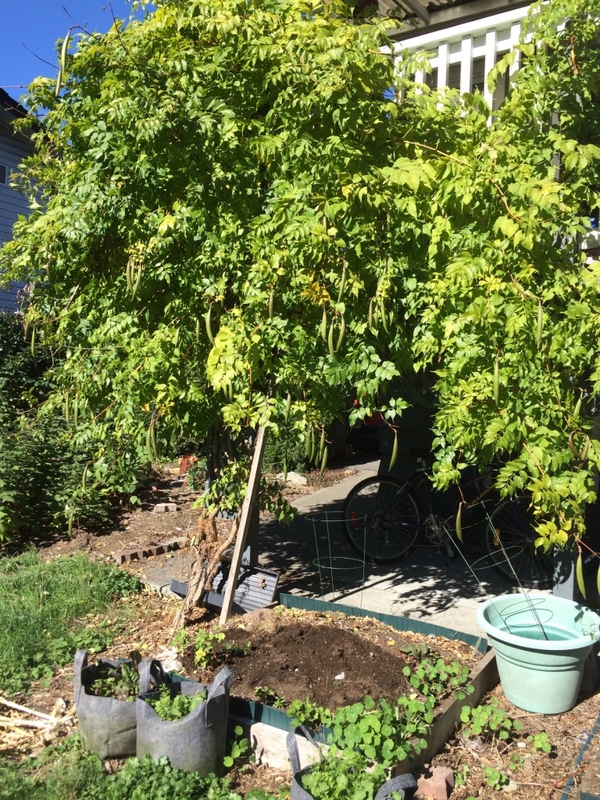 And one of the best recommendations: “gradually replace your deciduous trees with conifers…” Right. Cut down those Oaks and Maples and Lindens, never mind that they’re 100 years old and that you’ll replace them with trees that will either break the bank, or take 20 years to reach half-mature size. Sorry for the sarcasm, but Rodale, you really missed the boat on this one! 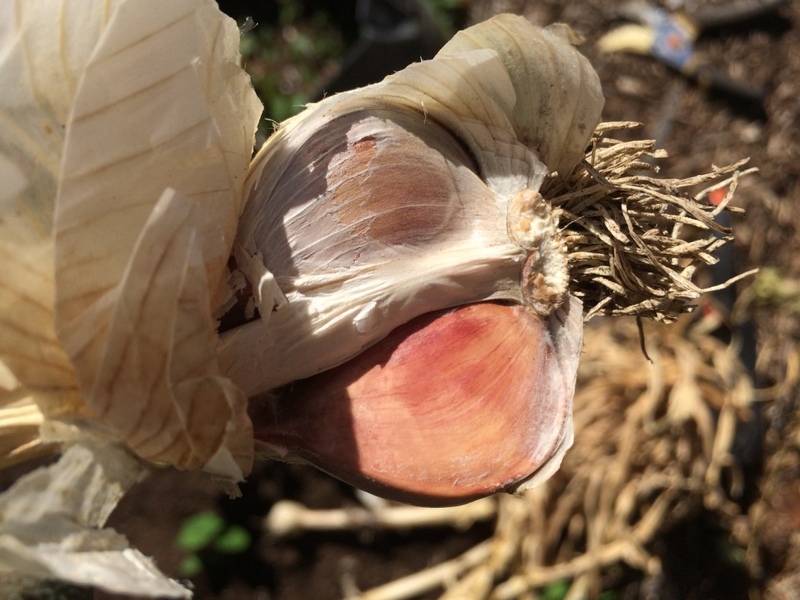 This is my third year planting garlic, so I’ve harvested twice before. The best of the harvest goes to the planting bed; the bigger the cloves that are planted, the bigger the cloves that are harvested. So I’ll get a better crop every year. In theory. This year I didn’t get nearly as many cloves as I’d expected. I may have not watered enough through the summer drought, or harvested a bit too early, so the cloves were a bit more vulnerable to rot. Whatever the reason, I think I only got about 20 cloves. Mound of compost ready to be spread. 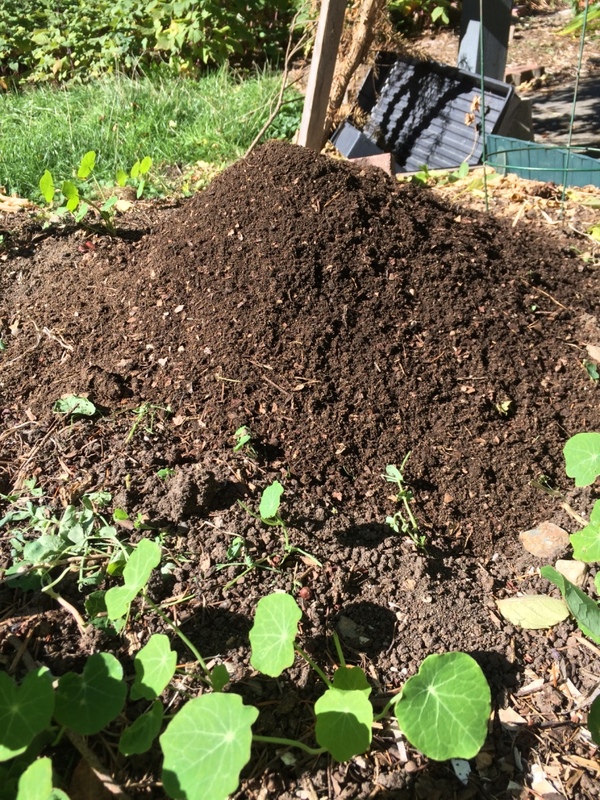 I cleared out extraneous material, then spread a 1-2″ layer of compost. This bed has never had any allium-family plants before; if you’ve had onions or shallots or scallions, choose a different spot. Most crops benefit from a four-year rotation cycle, which decreases the pest load, and allows the different vegetables to use nutrients in different percentages. Hardneck variety–don’t know the cultivar. 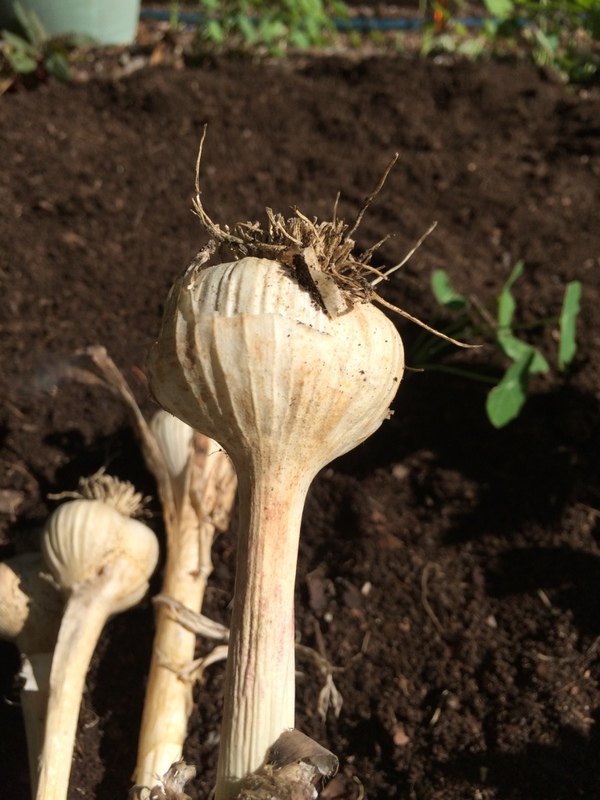 These garlics were harvested in late July, and allowed to “cure” since then. I tried to delay the harvest until ⅔ of the leaves were yellowing, but I may have jumped the gun on that. I could have cut off most of the stem and foliage, but the stiff stem made it easier for them to dry standing upright in a vase on the back deck. Hardneck variety, few cloves, all mostly the same size. The hard stem is a convenient lever to pry apart the cloves. Carefully pull off any loose papery skin, and then twist apart the cloves. Be careful not to take off the clove’s own skin and the “basal plate”. The basal plate is actually the stem of the plant, out of which the roots will grow. No basal plate, no roots. 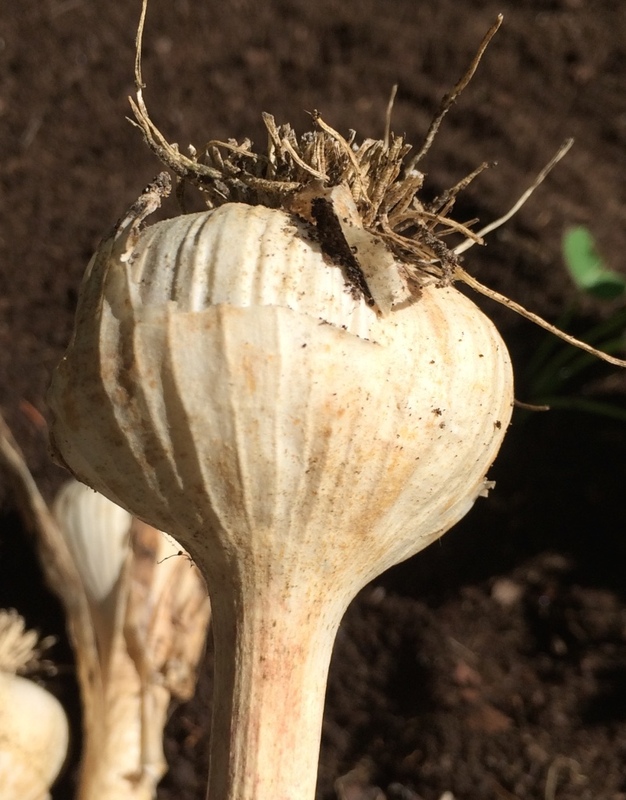 Thus the sad story of a garden blogger who had 75 garlic bulbs. 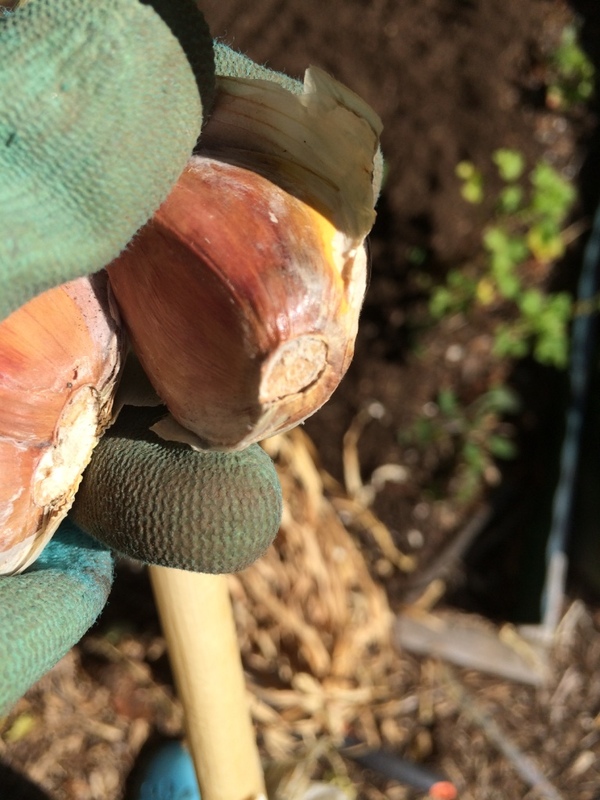 While preparing the planting bed, her teenage son decided to be very helpful, and “prepared” the garlic cloves by completely removing all the outer and inner skin, including the basal plate. This is a clove ready to plant. I may have got fewer than I’d hoped, but the size is still pretty impressive. 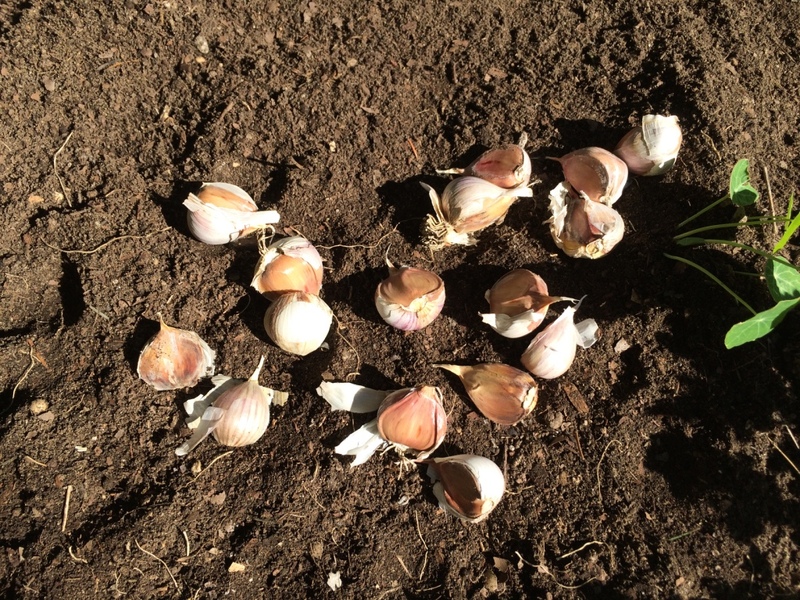 Some of the cloves were rotten, many of the bulbs only had two (large) cloves. So out of 16 plants I only got 16 cloves. That’s just not enough, so I’ll break down and go buy some. 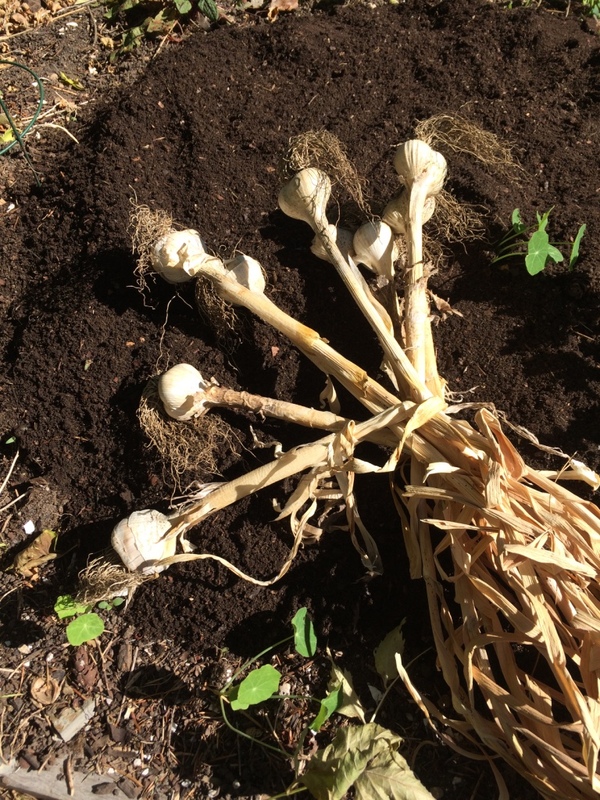 This hasn’t been a good year for the local garlic harvest (presumably the long drought), so the selection is pretty limited. 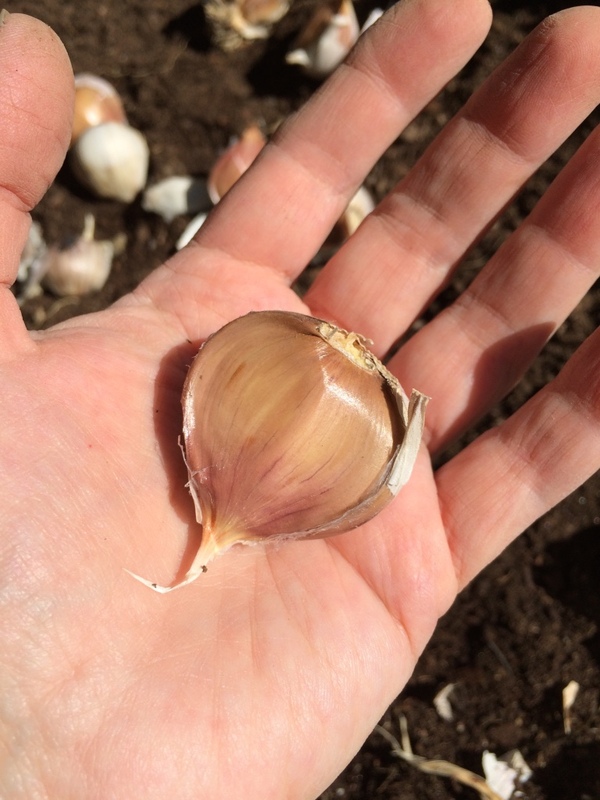 Previously I planted the cloves around 3-4″ deep, but I recently read they can go more like 5-6″ deep, so I’m opting for deeper. I’m hoping the squirrels won’t be interested–I think they dislike the allium smell. 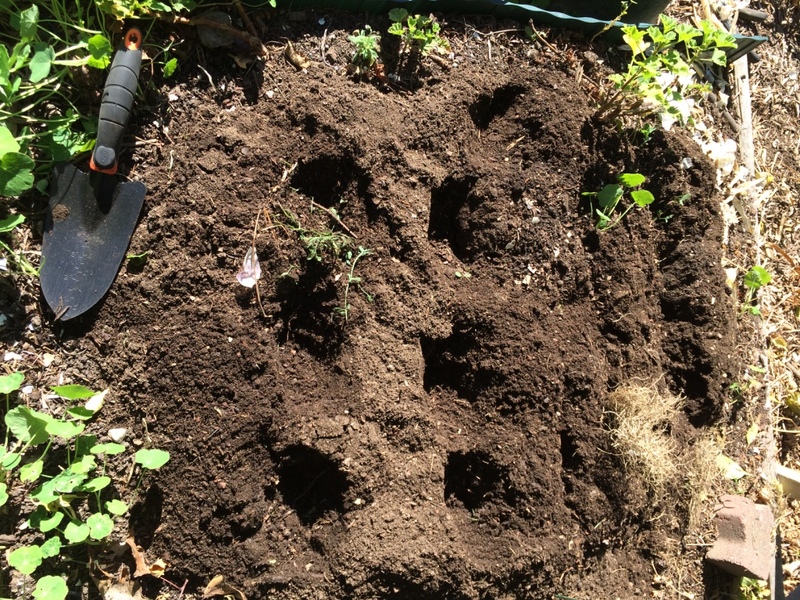 But just in case, the deeper they are the less like the squirrels will bother with that much excavating. 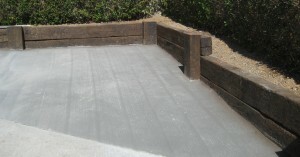 Before levelling out the soil. Protect the soil, insulate the bed, and help prevent weeds (another thing garlic doesn’t like) by mulching with an organic mulch. This rather effusive Campsis radicans will drop its leaves sometime this month, and provide a lovely bed of mulch for my garlics. I’ll have to monitor for weeds in the meantime. 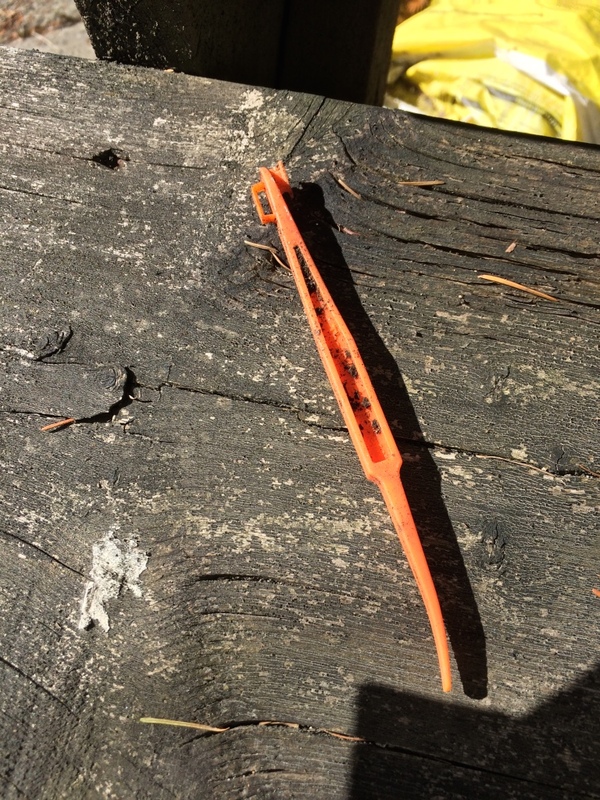 One of my favourite food tools, lost for … a long time.